Lee Yuk Wang continued to study at the High School of Lingnan-affiliated Middle School in Guangzhou in 1933. He then fulfilled the requirements and graduated his high school education 1939. 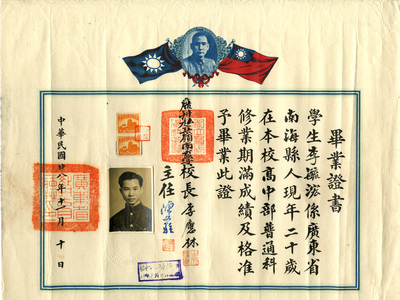 The graduation certificate was issued by Dr. Chung Wing-kwong and Chan Man-chu.